This information is provided by the USGS National Earthquake Information Center. For additional information and subsequent updates, including associated information and maps please consult the following web page, which will be available shortly: http://neic.usgs.gov/neis/bulletin/neic_qtan.html . A powerful earthquake has shaken the central part of the US state of Alaska, but there is still no word of casualties or damage. The 7.9 magnitude tremor shook the area near McKinley Park at 2212 GMT, according to the US Geological Survey. The epicentre of the quake was located 303 kilometres north-northeast of Anchorage, a major port and industrial centre of the state. ANCHORAGE, Alaska -- A major earthquake rocked a sparsely populated area of interior Alaska early Sunday afternoon, cracking highways and roads, knocking over fuel tanks and shaking rural homes. Earthquakes above magnitude 7 are considered major - capable of widespread, heavy damage. ``We expected this would have surface rupture that geologists could see on the ground and study,'' he said. KCAM-radio in Glennallen reported that fuel tanks in the village of Slana were tipped over and nearby highways were damaged. Paul Whitmore of tsunami warning center said the highway between Anchorage and Fairbanks was damaged and Alaska State Troopers closed the road to one lane. Cracks were reported in roads in the region. Jill Woster said she was driving between Fairbanks and her home in North Pole when the quake began. ``The car felt like it was going to fall apart,'' she said. Woster arrived home to find pictures off the walls and on the floor, along with glassware. ANCHORAGE, Alaska(November 3, 2002 4:30 p.m. AST) - A major earthquake rocked a sparsely populated area of Interior Alaska early Sunday afternoon, cracking highways and roads, knocking over fuel tanks and shaking rural homes.Bruce Turner of the West Coast and Alaska and Tsunami Warning Center in Palmer said the magnitude 7.9 quake hit at 1:13 p.m Alaska Standard Time and was centered 90 miles south of Fairbanks. "It shook for a good 30 seconds," he said. The quake was felt strongly in Anchorage about 270 miles south of the epicenter.The quake triggered the trans-Alaska pipeline's automatic detection system, said Alyeska Pipeline Service Co. spokesman Mike Heatwole. Operators then manually shut the pipeline down shortly after 2 p.m.Heatwole said helicopters were flying the length of the 800-mile pipeline and ground crews are physically inspecting for damage. No damage has been detected at 4 p.m.The earthquake occurred on the Denali Fault and had a shallow depth, said John Lahr, geophysicist at the U.S. Geological Survey's National Earthquake Information Center in Golden, Colo. Shallow earthquakes generally are felt over a wider area. "We expected this would have surface rupture that geologists could see on the ground and study," he said.The earthquake did not generate a tsunami considered damaging to Alaska, western states or Canada, Turner said.Alaska State Troopers received a report of one injury. Spokesman Greg Wilkinson said a man in Mentasta broke his arm after slipping on stairs during the quake. He said a Mentasta apartment building also was evacuated and occupants were gathering at the school because of a gas smell.Trooper Lt. Lee Farmer said a 3-foot crack opened up in one lane of the George Parks Highway, the main road between Fairbanks and Anchorage. A trooper was on the scene and a state Department of Transportation crew was on its way to assess damage. "Anybody with one of those lowriders out of Anchorage probably doesn't want to head that way," Farmer said.Troopers also responded to damage reports on the Alaska Highway near Northway, 256 miles southeast of Fairbanks, and the Richardson Highway near Paxson, 178 miles south of Fairbanks, where a 3-4 foot crack closed the highway, said Transportation Department spokeswoman Shannon McCarthy. She said repair crews hoped to have it opened within four hours.Residents of the Tok Cutoff, which leads from the Alaska Highway to Southcentral highways connected to Anchorage, said the quake knocked over fuel tanks.In Slana, which has no electric utility, families use diesel fuel to power generators. Sharrel Webster said without help in setting her family's fuel tanks upright, she was likely to lose food in her freezer.A semitrailer the family uses for storage was pushed over. "It's laying on it side," she said. The well casing on the family's well lifted 2 inches out of the ground and cracks opened up so wide that she could stick her hand them.Randy Schmoker, a metal worker in Porcupine Creek on the Tok Cutoff, was in his shop when he felt the ground move. "I thought, 'Oh good, an earthquake,' and then it got worse and worse," he said.The quake tipped over a band saw and other heavy tools, his 300-gallon outside fuel tank and moved a 150-pound anvil 20 feet across the floor.He stepped outside and saw the tops of trees whipping 20 to 30 feet back and forth. He said he expected the ground to crack open after a series of 8-inch waves spread out before him. "They looked like ocean waves," he said.An hour after the quake, aftershocks were still moving the ground every five minutes. Schmoker said he's a big game hunter and usually enjoys short earthquakes. "A charging brown bear I can handle," he said. "This scared the hell out of me. "Jay Capps, who owns a small grocery store midway between Tok and Glennallen, said he felt a low-level shaking for 15 or 20 seconds and then two "good-sized pops" before the earthquake hit.He and two other people ran from the store. "You actually felt the earthquake coming," Capps said. "It shook so bad you could not stand up on the front porch. "He watched as a 5-ton U-haul in the store parking lot sat rocking by itself. "It sounded like the trees were breaking roots under the ground," he said.Capps' wife, Debbie, was upstairs when the earthquake hit. She grabbed the china hutch and saved it from falling over, but an entertainment center with 26-inch television was destroyed.Capps said nearly everything fell off store shelves. "My store smells like liquid smoke, picante sauce and mayonnaise," he said.Karen Eldridge, who owns the Paxson Lodge with her husband Chester, said she also knew an earthquake was on its way. "I heard it coming. A big thud. A great big thud and then I looked at my plant and it was shaking and I says 'Here it comes. '""We all ran outside and was waiting out there for it to quit and it kept going and going and going and going, and then it hit again. We had three big jolts ... I held onto a big post. "Liquor bottles broke in the bar. Glasses on the bar smashed to the floor. Pictures flew off the walls. Oil in the fryer sloshed onto the kitchen floor.Eldridge said she isn't going to venture into the storage room until tomorrow to see what kind of damage is in there. "We have a big mess," she said.The earthquake was the second major episode in Interior Alaska in the last two weeks. A magnitude 6.7 earthquake centered about 30 miles southeast of Denali National Park hit at 3:27 a.m. Oct. 23.Earlier Sunday, a magnitude 4.0 earthquake centered 73 miles east of Denali Park hit at 9:47 a.m.
ANCHORAGE, Alaska (Nov. 4, 2002) - A major earthquake of 7.9 magnitude rocked a sparsely populated area of central Alaska on Sunday, causing some damage to roads but no deaths, the U.S. Geological Survey and state troopers said. USGS spokeswoman Carolyn Bell said the epicenter of the quake was near the Denali National Park, about 75 miles south of Fairbanks and about 175 miles northeast of Anchorage. It occurred just after 1 p.m. (5:00 p.m. EST). State troopers said the only known casualty related to the quake was a 76-year-old woman who broke her arm when she fell while fleeing her house in the village of Mentasta Lake. 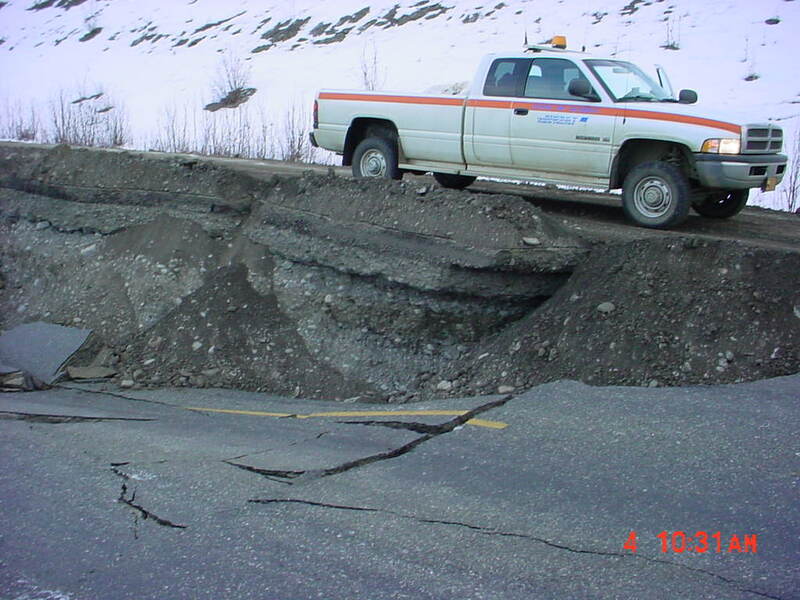 They said three major highways had been damaged, including the George Parks Highway between Anchorage and Fairbanks which was rent by a three-foot- wide crack. The trans-Alaska oil pipeline was shut down after the earthquake damaged some of the supports holding up the line, the system's operator said. The 800-mile-long pipeline, which normally delivers about 1 million barrels of crude oil a day, will stay shut through at least Monday while crews assess the damage and devise a repair plan, said Mike Heatwole, a spokesman for Alyeska Pipeline Service Co., the consortium that operates the pipeline. The earthquake did not damage the pipeline and no oil was spilled, Heatwole said. The Alaska Railroad, which runs through the earthquake area, suspended train service on Sunday and is evaluating possible damage, the troopers said. Police in Anchorage and Fairbanks said there had been no reports of damage in the cities, although the quake had been felt strongly in both places. The Perch Resort, a lodge and restaurant near Denali National Park, lost its entire inventory of wine when the quake smashed all the bottles, said owner Leslie LeQuire. About a dozen customers were eating in the restaurant at the time. ''The customers who were here were so awesome, they all stayed to help clean up,'' she said. ''I ran out to the car and it was hard to stand up. That's the first earthquake I ever felt outside. That's pretty unusual. We were a long way from the epicenter,'' he said. Whitmore said there had been several aftershocks. ''Sometimes we see that after big earthquakes the seismicity in the whole region may tick up. This is a good case for people to review their safety plans, make sure their bookcases are attached to the walls and so forth. It's really a good wake up call,'' he said. A tremor of 6.7 magnitude hit the same area on Oct. 23. NEW ORLEANS (AP) -- People here saw water in ponds, bayous and pools slosh about from what geophysicists say was caused by the awesome power of an earthquake in Alaska Sunday, over 3,000 miles away. "When you have an earthquake of this size, it generates what we call surface waves which are energy that travel through the earth's crust and these waves cause disturbances that can be looked upon as ripples or disturbances" in water, said Dale Grant, a geophysicist with U.S. Geological Survey's National Earthquake Information Center in Golden, Colo. In Mandeville, across Lake Pontchartrain from New Orleans, Carol Barcia, 47, was sitting with neighbors on the deck of her house around 5 p.m. when she saw boats bounce around. "We were just sitting outside on our back deck, just relaxing, and we noticed the sail boats started leaning over, going back and forth, and the boats' lines were just banging up and down. My boat was banging up against the dock. My neighbor's boat broke a line," Barcia said. "One poor guy across the canal from us fell off his sail boat," Barcia, a pharmaceutical representative, said. She said a neighbor rode a boat over Bayou Castine and helped the man out of the water. Similar stories were reported in other states, Grant said. It was a shallow earthquake -- centered about 6 miles underground -- and such earthquakes are generally felt over a wider area, Grant said. "This earthquake was shallow and the energy went directly into the surface and that is what causes these affects so far away," he said. Grant said he received calls from nuclear power facilities in various states -- including Minnesota and Washington -- that reported unusual water movement. He said an Oklahoma state geologist also reported that farmers there noticed water in ponds sloshed about. And throughout the New Orleans area people were baffled and frightened by what they saw. "My neighbors whistled -- they've got a pond right on the levee on the Mississippi River -- and that thing was churning, swirling and splashing out," said Dan Musmanno, a 51-year-old program manager at Northrop Grumman Corp.
"And they said my pond was doing the same thing. And it was. The water looked like it was coming up 7 or 8 inches, and the pool was splashing out as well," said Musmanno, who lives in Belle Chasse, a New Orleans suburb. "My neighbor actually thought there was an alligator in the pond. My neighbor's son went out there and said, 'It aint't no alligator,"' Musmanno said. "The water was going back and forth for about a half hour. It was kind of spooky." The earthquake, centered 90 miles south of Fairbanks, hit at 1:13 p.m. Alaska Standard Time, or 4:13 p.m. in Louisiana, said Bruce Turner of Alaska and Tsunami Warning Center. The earthquake occurred on the Denali Fault and had a shallow depth, said John Lahr, geophysicist at the National Earthquake Information Center. It is not uncommon for a major earthquake to shake waters hundreds of miles away, Grant said. "It's just a feature of how energy travels through the earth and it goes to show how powerful that earthquake this was." The earthquake's strength was no mystery to Paul Martin, Barcia's 59-year-old neighbor in Mandeville. An iron cleat bolted to his pier he ties his boat to was pulled out when his boat got tossed around. "The boat started moving, it was being tossed around, up and down, sideways, and it pulled one of the cleats out of the pier," he said. "At first I thought it was a boat going by, but then I realized a wake wouldn't do that, and I didn't know what it could be," he said. "It was quite a sight. All the boats up and down this bayou were being tossed around like little boats in a bathtub." Linda Lester of Mentasta Lodge began cleaning up after the quake shook her shelves nearly bare. There were aftershocks every few minutes and "the big one had everyone heading to the door," she said. Billy Carey and another driver were on their way from Seattle to Anchorage on Sunday, Nov. 3, when "the road fell out from under us" at Mile 77.5 of the Tok Cutoff. His rig and another were stranded overnight. On Monday, workers removed it from its precarious position. The day after a 7.9 earthquake throttled the Interior, jittery Alaskans there endured repeated aftershocks Monday as they sorted through jumbled homes and communities. Roads were mangled, zigzagged with dramatic cracks, and entire slabs of concrete sunk. Transportation commissioner Joe Perkins, joined by engineers, flew over the damage Monday. He said the devastation from Sunday's temblor was shocking and estimated repair costs could reach $20 million. The quake struck at 1:12 p.m., three miles deep, rumbling throughout Alaska and moving the earth in faraway areas in the Lower 48 -- including Ohio, Louisiana and Texas. Through Monday evening, 2,602 people from 112 North American ZIP codes reported the quake to the U.S. Geological Survey's "Did you feel it?" Web site. It was one of the strongest earthquakes recorded in North America over the past century, and the largest recorded along the Denali fault, which runs from Canada through the Alaska Range and past Mount McKinley. It hit about 270 miles north of Anchorage, 80 miles south of Fairbanks, and just a few miles from an Oct. 23 earthquake that measured 6.7. It spurred mudslides, buckled ground and triggered officials to shut down the trans-Alaska oil pipeline. 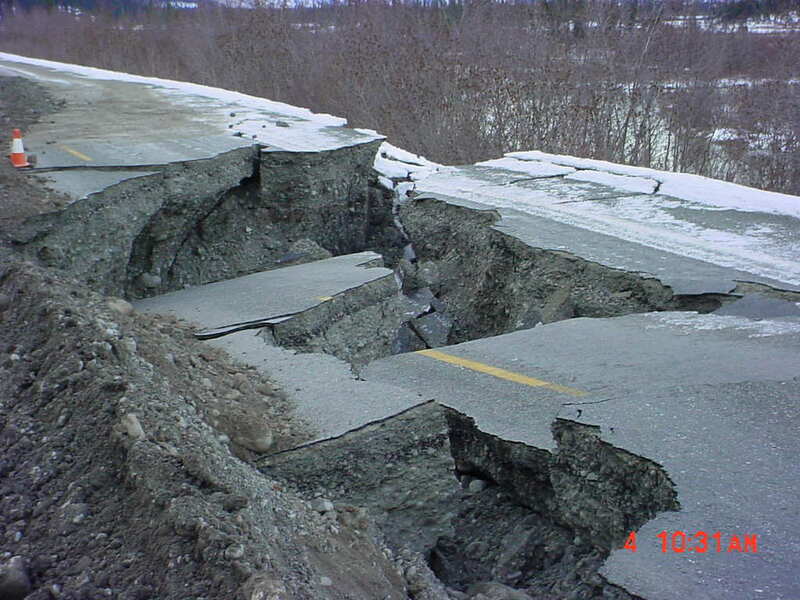 The worse damage was reported on the Tok Cutoff, Southcentral Alaska's most direct highway connection to Outside. The road was sliced with gaping cracks. Some sections had dropped as much as 12 feet. The quake isolated Slana and Mentasta Lake. Both villages reported porches wrenched from homes, televisions tipped and shattered. Ground waves moved parked cars. In Mentasta Lake, wells gurgled up brownish, undrinkable liquid. Propane barrels toppled over and oil and water lines burst. Foreboding cracks in the ground slithered around and beneath some cabins. Villagers said four homes were unusable. At least 60 people spent Sunday night at the recreation center, a large log building that seemed safe. Even in a state that gets more quakes than any other, people were rattled. "We still need a lot of water, diesel fuel for heat, food -- we can't get in or out on the road," Anne Phillips said from Mentasta Lake. "I feel totally claustrophobic, trapped like a rat. Last night, I was waiting for somebody to just fly in and take us all out. Every little sound -- we're running constantly to doorways. We need help." Today the Alaska Department of Emergency Services is sending damage assessment teams to Mentasta Lake and Slana, and to Tetlin, Northway, Healy and Cantwell, Interior villages also hit hard by the quake. A liaison also will visit Fairbanks, the most populated town close to the quake. Gov. Tony Knowles could declare a disaster, which would open the door for funds from the Federal Emergency Management Agency for highway repairs. The Alaska Department of Transportation reopened the Richardson Highway, though traffic is narrowed to one lane in several spots. One lane of the Tok Cutoff was temporarily open Monday. The road is scheduled to be open from 7 a.m. to 7 p.m. today, with a pilot car leading single lines of traffic through a 10-mile stretch. Drivers should expect one-hour delays, said Shannon McCarthy, a DOT spokeswoman. "We've roughed in a road that you can get through if you are careful," Perkins said. "If somebody hit one of those holes, it would be all over." A contractor from Fairbanks was moving in heavy equipment for an emergency repair job there. That should be done in two weeks, if the mild weather holds. But the strip will need to be rebuilt next summer, Perkins said. "It is rather amazing to see the force of this thing. It just peeled asphalt up like it wasn't even there," Perkins said. While officials ran inspections and drafted plans Monday, communities rallied -- whether it meant reorganizing bookshelves, comforting children or providing a warm bath or safe place to sleep. "When this happened, it was just natural for everybody to help," Phillips said. "It gives us something else to think about." Shortly after the quake struck, people in Slana flocked to Midway Service, a mom-and-pop store at Milepost 61 on the Tok Cutoff, three miles before the road closure. People flowed in and out Monday, bringing sleeping bags to share. Owner Jay Capps let stranded travelers use his showers and sleep in his small guest cabin out back. "I had over a dozen people in the store helping me pick up stuff from the floor," Capps said. "Thirty percent of my inventory was on the ground." Cleanup took 12 hours, he said. They filled two 55-gallon trash cans with broken stuff. Half-inch cracks webbed across sheetrock. The front porch shifted several inches from the building. Capps estimates his total damage is at least $5,000. "We lost a 29-inch TV set, the VCR, everything was smashed," Capps said. "The only thing that stayed on the wall was the stupid gun cabinet. "We took a pretty doggone good beating." Joe Riley swung by the store Monday to e-mail family and friends that he was OK. He runs a snowmachining lodge about three miles in from Mile 72 on the Tok Cutoff. "At the lodge, I lost a couple hundred dollars worth of booze and some glassware," said Riley. "Just up at Mentasta Lodge up the highway there, I've heard their building is totalled." The Mentasta Lodge's parking lot is reportedly knotted with heaves, the basement soaked with water from a broken line. Yet in the quake's aftermath, the owners still offered free food and lodging to truckers Bill Miller and Billy Carey on Sunday. Miller and Carey were hauling refrigerated groceries in a Carlyle semi when the earthquake struck, pulverizing the Tok Cutoff beneath them. With Carey at the wheel, the rig jolted like it had struck a giant frost heave, Miller said. Moments later, the highway ahead split at lightning speed. "Billy, he hollered, 'Earthquake!' " Miller said. "He tried to straddle the biggest one, but the right front wheel got down inside it." With its front axle straddling the edge, both front wheels of the Kenworth sheared off and the rig came to rest on its oil pan, Miller said. The load hadn't tipped or jack-knifed, and both men were OK.
After calling headquarters by satellite phone, Miller and Carey and two drivers from another truck walked a quarter mile back to the Mentasta Lodge. The owner welcomed them. "It had knocked the lodge off the footings, and everything in the lodge was just trashed," Miller said. "But people were just so nice. She said 'We're all in this together. We're not charging you anything.' She was devastated too. My understanding is she didn't have any insurance." Mentasta Lake's school suffered reported structural cracks in the quake. School was closed Monday and probably will remain closed today, according to residents. People are pooling food, Phillips said. Some folks were talking about having a bonfire Monday night and making moose stew. Everyone has somehow been impacted, she said. "It will take us weeks just to clean up the house and we have a small palace -- a little cabin with one bedroom," Phillips said. "I'm still shook up, to tell you the truth. I've never prayed so hard in my life." State troopers only know of one quake-caused injury. A 76-year-old Mentasta Lake woman broke her arm after falling down stairs in her home, trying to leave during the quake. There have been hundreds of aftershocks -- some beginning before previous ones ended, including a 5.1 quake that hit at 3:50 p.m. Sunday, said Alaska state seismologist Roger Hansen. "Some of the stuff we cleaned up and put back on shelves, the son of the guns fell back down again," Capps said. "My wife slept with her clothes on and on the couch last night, and so did half the community, I think." Scientific teams on Sunday and Monday took Global Positioning System measurements and placed additional sensors to monitor the aftershocks. Additional equipment was already in the field because of the Oct. 23 quake, seismologists said. The Denali fault curves through Canada and the heart of the Alaska range. It's the longest U.S. fault where plates move horizontally, with land to the south hedging west and land to the north slipping east. 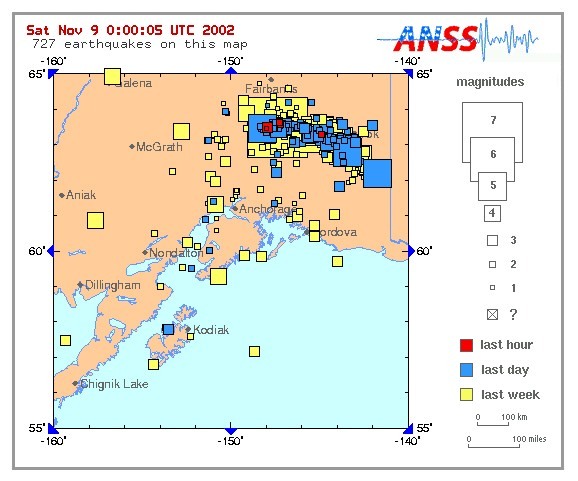 "They're a very interesting pair of earthquakes," said state seismologist Roger Hansen, at the Earthquake Information Center in Fairbanks. "One began and unzipped in one direction, and the second (large quake) just unzipped the fault in the other direction." The rupture rapidly ripped east and southeast along the fault, moving almost two miles per second for almost 80 seconds, Hansen said. In the end, land may have shifted a few feet along a 150-mile-long crack that reaches 12 miles deep into the crust. People shouldn't assume that other quakes won't happen later or hit other faults at any time, Hansen said. 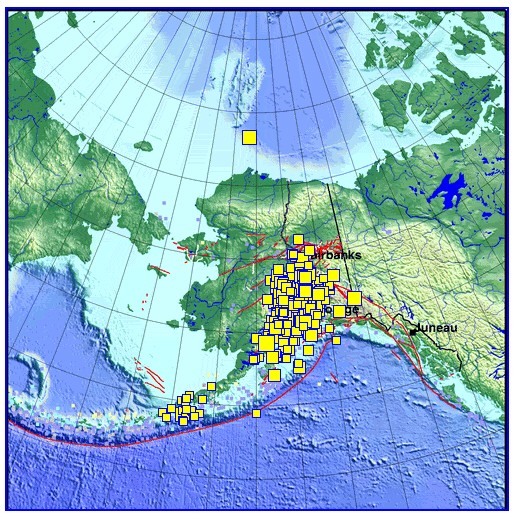 "Alaska has more earthquakes than anywhere else in the country," he said. "This is a reminder that we do have earthquakes. Earthquakes don't stop. They continue." PHILADELPHIA (AP) - The weekend earthquake in Alaska that churned up waves on a Louisiana lake and rippled swimming pools all over the country also temporarily muddied well water in homes more than 3,000 miles away, geologists said. Well-drilling companies got scores of calls Sunday and Monday from Pennsylvania customers complaining about water turning cloudy or muddy. "It was really brown, like diluted iced tea," said Joanne Volm of Harleysville. "The kids didn't want to bathe in it." U.S. Geological Survey offices around the country were inundated with calls after the 7.9-magnitude quake hit at 5:13 p.m. EST Sunday a remote region near Alaska's Denali National Park. Ocean-like waves rolled ashore on a lake in Washington state, boats were tossed around on Lake Pontchartrain in Louisiana, and water sloshed around in swimming pools around across the East. Waverly Person, a USGS geophysicist in Golden, Colo., said stirred-up wells also were widespread. "This type of phenomenon happens with big, shallow earthquakes," Person said. "The surface waves from this earthquake were recorded for hours and they were just rolling around and around the earth." In Temple, 50 miles northwest of Philadelphia, homeowners with wells started calling within hours, said Richard C. Stump II of Suburban Water Testing Labs Inc.
"Starting Sunday night and into Monday morning people were reporting that their wells were turning a muddy color," Stump said. At least 10 people called a Montgomery County well driller, Miller Pump Service of Cedars, with the same complaint, Rhea Gross of Miller's service department said. Heavy rain muddies wells "once in a while, but not that many, scattered all around," Gross said. No serious injuries were reported in Sunday's quake, but officials estimated the damage to Alaska highways would cost $20 million to repair. Geologist Peter Haeussler of the USGS explains what he's learned from the videotape he shot Monday along the Denali Fault. 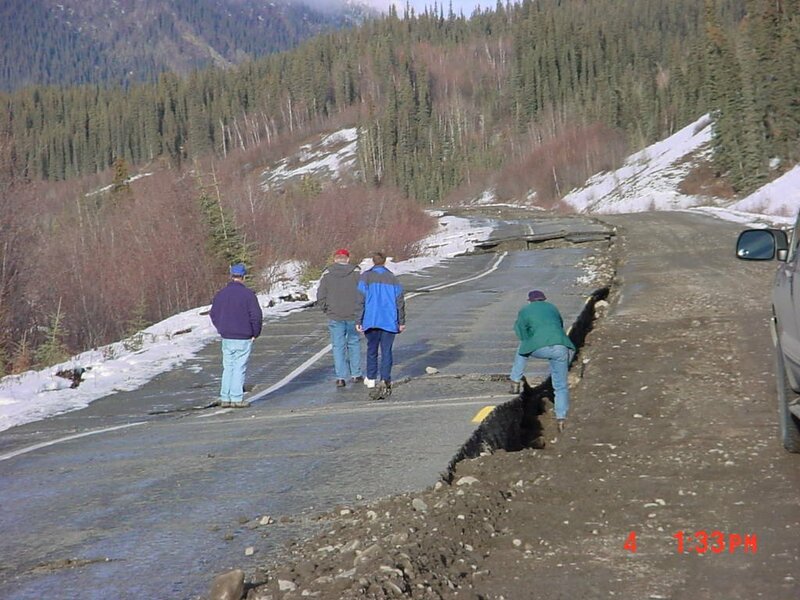 Anchorage, Alaska, Nov. 7, 2002 - Geologists say Sunday's 7.9 magnitude earthquake ripped a 145-mile scar across Alaska, and rearranged some of the landscape by as much as 30 feet. Peter Haeussler of the U.S. Geological Survey took a helicopter along the Denali Fault on Monday to videotape how the quake had reshaped the terrain of Interior Alaska. Thursday, he took time to share his video and his impressions of what he'd seen. Peter Haeussler, with the U.S. Geological Survey, shows his photos of the 7.9 magnitude earthquake. The huge, jagged crack is easily seen against the snowy backdrop of one scene. "Just screaming across the countryside," Haeussler said. It screamed through tundra, under rivers, under the oil pipeline, across snow-covered hillsides and through glaciers, which may not be that interesting scientifically, but is rare because few fault lines are at this latitude. "It was amazing the amount of detail that you could see in the surface as a result of it," Haeussler said. What is interesting scientifically are the big chunks of broken-up landscape. Haeussler calls if "offset." The quake may have set a record for offset -- some of the earth separated as far as 10 meters, roughly 32 feet. Haeussler says measuring offset helps to more accurately chart what happened as far as 12 miles down into the earth. "It's very important to tie those surface measurements of offset with what the seismologists are learning from the earthquake wiggles about how the earthquake worked," he says. 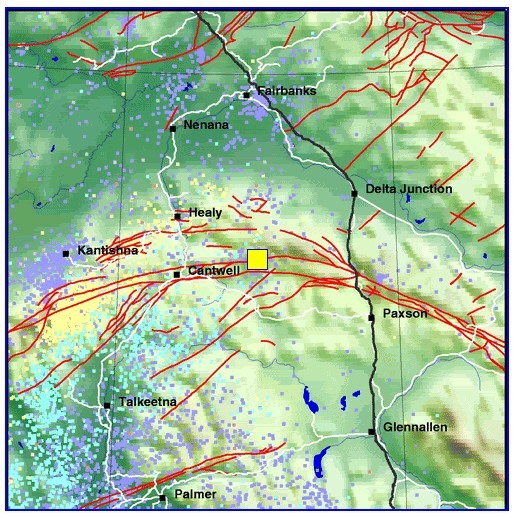 Much of the quake followed the Denali Fault, but it did veer southeast in one section along the Totschunda Fault line. Researchers had not seen that before. Until now, no one really knew where the fault line passed in the lowlands along the Richardson Highway. At one point, the pipeline crosses the fault, and had the original engineers known that, they might have rerouted this section. As it was, they designed the line so it could slide slightly -- and that mostly worked. The damage is evidence that the fault line runs just below it. "The pipeline did really well," Haeussler said. "They could maybe do things a little bit better in the future. On the other hand, it will probably be a long, long time. The pipeline may actually be out of commission by the time the next very large earthquake like this one occurs on this fault." Seeing the side of a mountain that had literally fallen away was an awesome sight, Haeussler said, and it's a good thing no one was there Sunday. "I was thinking, if you were standing there, you'd be dead." Haeussler is planning another trip along the fault this weekend. He said it's critical to get measurements now, before rain or snow damage or cover up the most fascinating scar most Alaskans will ever see. Researchers say that, compared with California, there are fewer aftershocks than usual, and they are decaying at a faster rate. But they do predict that Alaska may see several more aftershocks of magnitude 5 or greater during the next month. Haeussler said researchers can take some of the data gained from these studies and use it to build better homes, buildings, roads and other structures that can withstand large quakes. Because of an earlier, smaller quake on Oct. 23, seismologists already had some important instruments on the ground that were able to measure the larger quake that occurred Nov. 3. PASADENA, Calif. (Reuters) - A 7.9 magnitude earthquake in Alaska earlier this month was triggered by one of the largest fault ruptures in at least 150 years, rivaling the one that caused the great 1906 San Francisco quake, geologists said on Wednesday. The Nov. 3 quake struck a remote and sparsely populated area near Denali National Park and caused only minor injuries, though it damaged three major highways and forced officials to temporarily shut down the Trans-Alaska pipeline. A team of geologists who spent a week studying the temblor determined that it was largely caused by a rupture of a 130-mile section of the Denali fault, with horizontal shifts of up to nearly 26 feet. Kerry Sieh a geology professor at the California Institute of Technology in Pasadena, said that rupture ranks in size alongside those that caused two great earthquakes along California's San Andreas Fault, including the 1906 San Francisco quake and another major quake in 1857. Sieh said the Denali and San Andreas are both "strike-slip" faults, meaning that blocks on either side of the fracture move sideways relative to one another. Over millions of years, he said, the shifts have moved southern Alaska miles westward relative to the rest of the state. He said the shifts have produced a set of large aligned valleys through the middle of the snowy Alaska range, from the Canadian border in the east to Mount McKinley in the west. Along much of its length, Sieh said, the Denali fault crosses large glaciers and during the quake broke up through the glaciers, offsetting large crevasses and rocky ridges within the ice. The earthquake also shook loose thousands of snow avalanches and rock falls. He said that in some places enormous blocks of rock and ice fell onto glaciers and valley floors, skidding a kilometer or more out over ice, stream, and tundra. The team of investigators included geologists from several organizations, including Caltech's Division of Geological and Planetary Sciences, the U.S. Geological Survey, Central Washington University, and the University of Alaska. The rugged range is traversed by just two highways, and so the scientists used helicopters to access the fault ruptures in the remote and rugged terrain. The scientists were surprised to discover that the fault rupture moved only east from the epicenter and left the western half of the great fault unbroken, Sieh said, prompting them to speculate that the quake could have been the first in a series of large events that will eventually include breaks farther west toward Mount McKinley and Denali National Park. ANCHORAGE, Alaska (Reuters) - While it did little serious damage, the magnitude-7.9 earthquake that rattled interior Alaska earlier this month revealed a bounty of scientific information for seismologists and geologists. They discovered deep cracks in glaciers that mirror the fault at the quake's source and a previously undetected neighboring fault, and they gained a better understanding of earth movements and earthquake ripple effects. The Nov. 3 earthquake started as a vertical thrusting motion south of Fairbanks, then transformed into a horizontal shaking motion along the well-known Denali fault, releasing most of its seismic energy on the eastern end, scientists said. A quake of 7.9 magnitude is capable of causing tremendous, widespread damage in populated areas. In that thinly populated part of Alaska the earth shifted as much as 22 feet, leaving chasms in roadways, knocking buildings off foundations and tipping over heavy fuel tanks. "If this would have happened in California, it would have been just disastrous," Alaska state seismologist Roger Hansen said. The initial shaking led to the discovery of a previously unknown thrust fault, a feature that moves vertically. "The discovery of the thrust fault was completely a surprise," said Peter Haeussler, a U.S. Geological Survey scientist helping lead the post-quake studies. "Before that, it was completely unknown. People didn't know that fault existed." The earthquake was the first recorded since 1958 that had run beneath a glacier, he said. Aerial surveys after the earthquake revealed deep cracks that followed the Denali fault's route. "It's almost like a huge mole track," Haeussler said. Until now, scientists had not known exactly where the fault ran beneath the glaciers. The cracks and marks on the ice surface solved that mystery, he said: "There it is. There's the location." Details about the earthquake were gleaned with the help of instruments already in place, some of them put there after a magnitude-6.7 temblor that occurred in the same area two weeks earlier. Some of the findings are documented in a so-called "ShakeMap" issued by the USGS. The map, the first of its kind, identifies the areas of most violent shaking and is meant to help emergency managers plan for future events. The Denali fault has been studied for years, but until recently some scientists were unsure whether it was capable of producing a major quake. Not so after Nov. 3, said Hansen. "I think that laid that to rest," he said. The Denali fault, a so-called "strike-slip" system located entirely on land, is similar to California's famous San Andreas fault. But the effects of the earthquake were far different from what they would have been farther south. "This type of quake would be the, quote, Big One, unquote, that they are all expecting on the San Andreas fault," Haeussler said. Alaska's most destructive earthquake hit magnitude 9.2 in 1964 and killed 131 people. That earthquake was centered offshore in Prince William Sound and was produced by a different type of fault, one that separates oceanic and continental rocks. It was the second most powerful earthquake in recorded history. The Nov. 3 temblor, though one of the most powerful recorded on U.S. soil, produced only one serious injury, a broken arm suffered by an elderly woman who slipped while fleeing her home. Much of the property damage occurred to roads and bridges, where the toll is at least $25 million, according to state estimates. Some affected villages have had drinking water problems. The trans-Alaska oil pipeline shut down after pieces of some vertical supports fell off, but the line itself was unscathed and oil flow resumed three days after the earthquake. Fairbanks, Alaska's second-biggest city, was spared the brunt of the earthquake, even though it was only 93 miles north of the epicenter. That was thanks to the eastward trend of the seismic energy. At the time the quake struck, Hansen, a Fairbanks resident, thought it was merely an aftershock of the Oct. 23 shaker. Coffee sloshed from a cup on his table, and a picture fell of a bookcase, but the earthquake did not seem that powerful to him, he said. "I didn't think much of it until I realized it didn't quit," he said. Copyright 2002 Reuters News Service. All rights reserved. The Alaska Earthquake Information Center located a strong earthquake that occurred on Wednesday, October 23rd at 3:27 AM AKDT in the central region of Alaska. This event has been felt strongly from Anchorage to Fairbanks. Follow this link to see Community Internet Intensity map. This event occurred on the Denali fault. The first motion focal mechanism is typical for events in this area and indicates right-lateral strike-slip motion. The Nenana Mountain magnitude M 6.7 earthquake ruptured a segment of the Denali fault in interior Alaska, east of the Parks Highway and the community of Cantwell. The Denali fault is a major, seismically active fault that arcs through Alaska, slicing the rugged Alaska Range and bounding the preciptious north face of Mt. McKinley, the highest peak in North America. The streams and glacial morraines crossing the fault have been offset and record the long-term displacement of the fault. Scientists believe the fault is capable of generating earthquakes as large as magnitude class 8, but none that large have been recorded in historic time, since the beginning of the last century. The Nenana Mountain M 6.7 shock is the largest earthquake on the Denali fault since 1932 when three magnitude 6.0, 6.9 and 6.0 shocks occurred within a 5-month time period. The 1932 events were located at the western end of the Denali fault (lat 62.5N and lon ranging from 152.5W to 153.3W). The largest recorded event that can be attributed to the Denali fault was in 1912, when a M 7.2 earthquake occurred more than 50 miles to the east of the October 23 temblor. 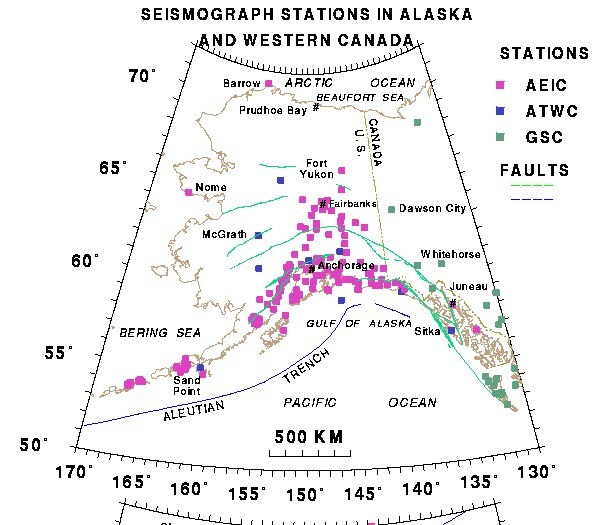 Since there were no seismographs operating in Alaska at that time and no reports of surface faulting in the remote Alaska Range, the location of the 1912 shock is not well-constrained. The most recent known earthquake on the Denali fault prior to the Nenana Mountain event is a M 6.2 shock that occurred on August 31, 1958. That shock was centered well east of the Richardson Highway and the Trans-Alaska Pipeline, more than 100 miles to the east of the fault segment that broke today. The seismic behavior of the Denali fault, like the northern and southern segments of the San Andreas fault in California, is characterized by infrequent large earthquakes. This behavior contrasts to the segment of the San Andreas in central California where frequent small earthquakes and continuous fault slip gradually releases the strain in the Earth's crust caused by global plate tectonic motion. Automatic systems detected and located over 210 aftershocks through 5 pm AKT of November 1. The analysts located ~445 aftershocks. 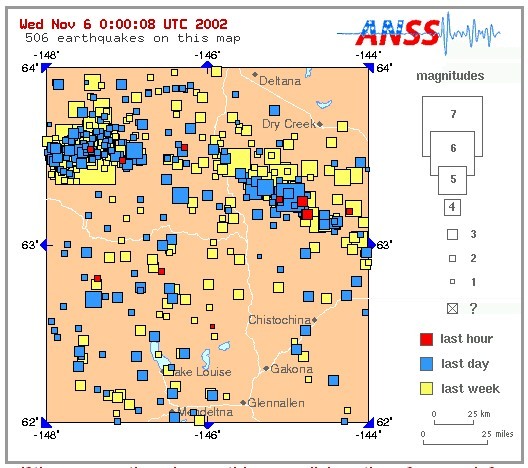 The largest afershock was a ML 3.8 three hours after the main event. The automatic system detected and located over 200 aftershocks through the end of October, the data are being scanned by the AEIC analysts and all aftershocks are being located. 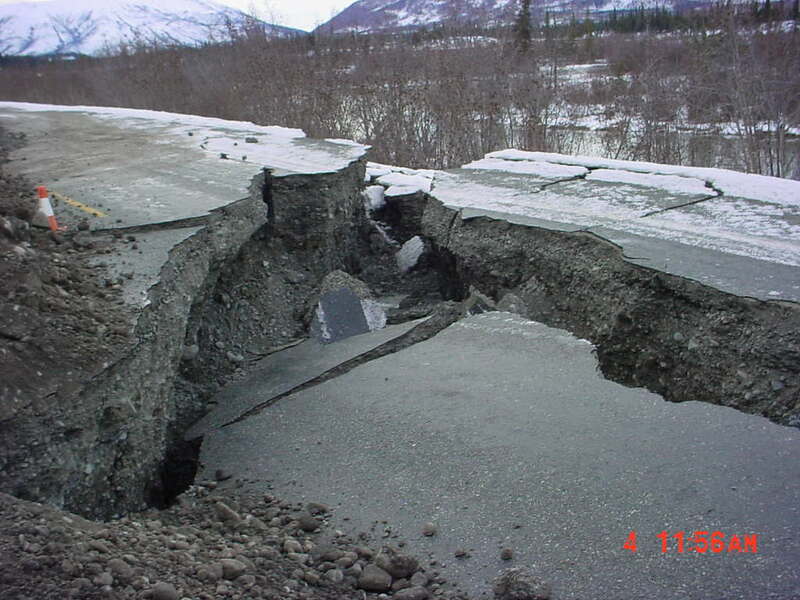 A GPS crew visiting earthquake site on Oct.23rd observed fresh multiple cracks in the Denali Hwy roadbed. Follow this link to find out more details and view some photos.